A Birmingham City University researcher is examining the challenges facing black and minority ethnic (BAME) women makers in the UK, in relation to their online profile and presence. In collaboration with Crafts Council UK, Dr Karen Patel conducted interviews with 17 female craft makers who self-identify as from a BAME background, as well as hosting workshops in London and Birmingham to gather data for her study. According to Crafts Council UK, there are an estimated 129,000 people working in craft occupations. 78 per cent of those in full-time employment are male, with women makers more likely to be self-employed and part-time. “It is a concern that women tend to be in the more precarious positions in craft,” said Dr Karen Patel, a PhD scholar at Birmingham City University’s Centre for Media and Cultural Research. Dr Patel’s research found that cultural expectations of British South Asian women can deter creative career aspirations. 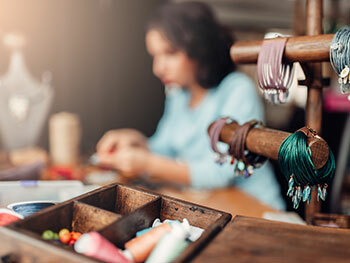 The research also discovered a lack of confidence amongst BAME women in using social media and fears that their identity being exposed online could impact on their success in the crafts industry. “A conversation arose in the Birmingham workshop amongst black women who said they didn’t post a picture of themselves online in association with their crafts work, for fear of it potentially devaluing their work or exposing themselves to criticism,” said Dr Patel. Highlighting the importance of the research, Rosy Greenlees, Executive Director of Crafts Council UK, said: “Dr Patel’s research will feed in to how we support makers from any cultural background and at any stage of their career. In promoting craft businesses, the story of the maker is often deeply entwined with the craft product itself. The Crafts Council recognises that for the UK craft sector to continue to be world-leading we need to support and champion a diverse range of makers. Dr Karen Patel is continuing her research in a new two-year project funded by the Arts and Humanities Research Council, exploring diversity and expertise development in craft. For more information, visit the craft expertise website or email karen.patel@bcu.ac.uk.